Parcans, speakers, moving heads, mirrorballs, trussing, brackets, projectors, flatscreen monitors, all different products with one thing in common. As soon as they are being used, either static or as moving effect, in elevated positions or over people or crowd you are required to use an independent secondary safety-device according to BGV-C1 and VGB regulations to ensure the safety of the visitors of your venue. Safety-cables need to be used in all these cases to secure your gear and to make sure that, in case of emergency, the secured static equipment does not fall more than 20 cm or, with moving equipment, no more than 5 cm to prevent the impulse forces from becoming too high. 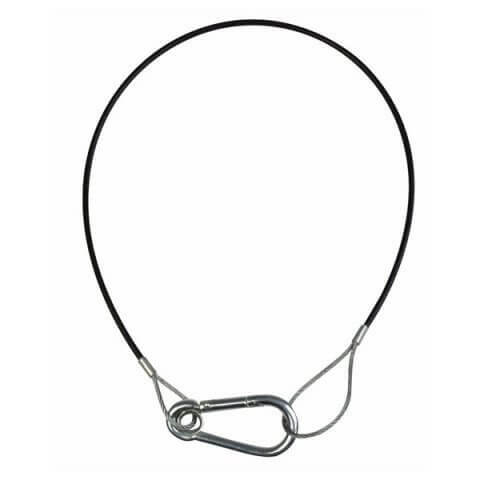 Just as important as the safety-cable itself are the chainlinks, carabine-hooks or catbiners because the whole is as strong as its weakest component. That is why our safety-cables are also equipped with certified connectors to guarantee a safe use as long as the cable and the link are handled according to its specifications. Safety-cables can be used single or double stranded to carry and secure their specified load. Please check the specs with each cable to find the cable which matches perfectly to your needs. One point of attention: safety-cables are meant to secure your gear and not to be used for hoisting equipment. You can use our well-equipped Lodestar-range for this purpose.